Health inequalities are a social justice issue, and the challenge of addressing them is core to public health practice. In England, people living in the least deprived areas of the country live around 20 years longer in good health than those living in the most deprived areas. Reducing health inequalities means giving everyone the same opportunities to lead a healthy life, regardless of where they live or who they are. Local authority public health teams are faced with having to increasingly meet this challenge, and it is made even more difficult as they are under growing budget pressures. It is therefore essential that the limited resources are deployed in a way that maximises opportunities to address inequalities for those at greatest risk of poor health. PHE’s evidence report on health inequalities in the East Midlands provides a regional view of this challenge, and the ways in which local public health teams can work more systematically towards improving health and wellbeing for the population of their region. The average life expectancy at birth across the East Midlands in 2013-15 was 79.3 years for males and 82.9 years for females, both of which are significantly lower than the national average. Healthy life expectancy was 62.5 years for males, significantly worse than the national average, and 63.5 years for females, which is similar to the national average. Further, the impact of the social gradient on health inequalities is clearly demonstrated, with males in the most deprived areas of the East Midlands living for 8.6 years less than males in the least deprived. For females, the gap is 7.1 years. In the East Midlands, the gap between life expectancy and healthy life expectancy is referred to as the ‘window of need’, and is the number of years that an individual can expect to live in ill health. In 2013-15, the window of need in the East Midlands was 16.8 years for males and 19.4 years for females. This makes the proportion of life spent in poor health over one fifth for both males and females, with 21% of life lived in poor health for males and 23% for females. Understandably, the reduction of the window of need is one of the main focal points of public health activity in the East Midlands. However, the challenge continues, as the size of the window of need has increased on average for both males and females. On the contrary, preventable mortality from liver disease has increased by 37%. There is considerable variation in preventable mortality from the major causes of death across the East Midlands local authorities, with an urban-rural divide where the urban areas of Nottingham, Leicester and Derby have significantly lower life expectancy than the average for England. For each preventable cause, these three urban areas consistently have the highest preventable mortality rates in the region, as they are associated with the highest levels of deprivation. The number of years that people spend living in ill or poor health in the East Midlands is driven by multiple risk factors including obesity, alcohol and drug use, diet, and occupational risks, which will also be driven by the wider determinants of health. As such, it is essential that there is a continuation and upgrade in preventative measures – namely public health programmes and interventions – that mitigate the onset and development of preventable illnesses. Ultimately, this will lead towards a narrowing of the window of need in the East Midlands, a decrease in preventable mortality, and a reduction in variation both across the region and in comparison with the national average life and healthy life expectancies. PHE’s Health Economics resources are available for local authorities and public health teams to use to make the best possible commissioning decisions that are evidence-based, transparent and defensible. They allow these teams to move away from making investment decisions based on historical spending trends, and disinvestment decisions based on simply reducing all programme budgets by the same percentage, commonly called ‘salami slicing’. This is crucial during a time that sees budgets continuously being cut. The resources also greatly simplify the otherwise often complex decision-making process by highlighting which public health concerns and programmes should be prioritised. Ultimately, this leads to investment in the most needed programmes, which in turn will improve the health of the region’s population and reduce health inequalities. 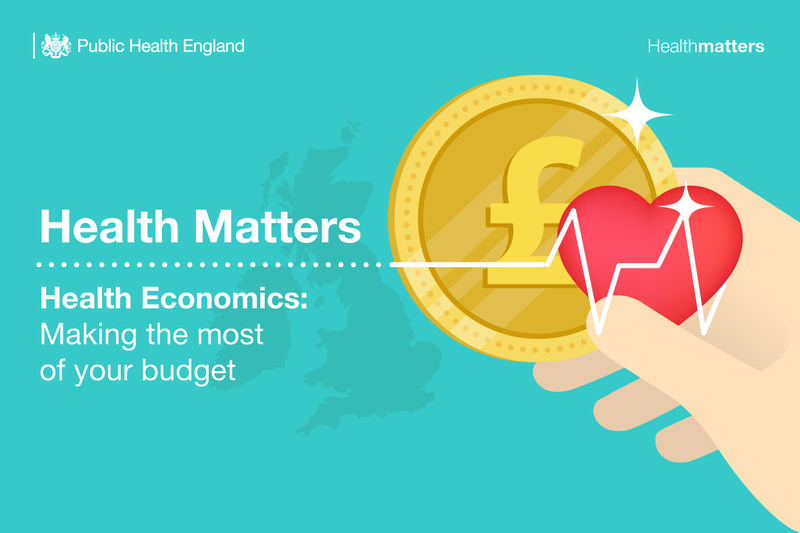 The latest edition of PHE’s Health Matters, ‘Health Economics: Making the most of your budget’ details these resources and how they can be put into practice by local public health teams. Part of the problem is if you work then getting a GP appointment is a lottery, as you are not allowed to book more than a day in advance - and even then you have to ring at 8.30 and fight for an appointment. The GP hours are Mon-Fri during the day so GP appointments are geared up to those don't work. In time your condition deteriorates until you are off sick - THEN you get a GP appointment - and deteriorate further waiting to see a Consultant, adding more cost to the NHS. GPs are basically inaccessible to those working. I work in the NHS and it's clear that if you ort that out you avoid a lot of problems. Some GP surgeries have started to remain open for longer like our practice in Leicester which is open till 6.30pm every day and till 8.00pm on Monday. I work for the NHS as well and I agree it would be great if problems are sorted out at the GP stage. If all GP surgeries allow online bookings then things will improve.